Our homegrown turkeys are known as the best you can buy. The turkey business is very important to us because it’s where our business truly started over 60 years ago. We buy our turkeys as day old chicks from a hatchery in Ohio. They are fed a combination of homegrown corn, soybean meal, vitamins and water. We grind our own feed to perfectly match the concentration to the age of the growing turkeys. Our turkeys are not given any growth hormones, antibiotics, preservatives, or fillers. They are full grown at 18-23 weeks. 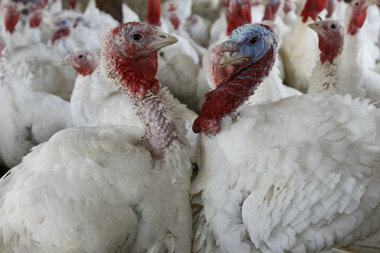 The turkeys are processed and sold only here at Ashley Farms. Our turkeys range in size from 14-45 pounds. A hen (female) turkey ranges in size from 14-22 pounds. A tom (male) turkey ranges in size from 23-45 pounds. We have fresh turkeys available from September to December and fresh-frozen turkeys available year round. Our fresh-frozen turkeys are just as juicy and tender because they are flash frozen to preserve the flavor. Ordering a turkey for Thanksgiving is a must! We start taking orders the day after Labor Day. Feel free to call in your order or stop by our market to place your order! So… what makes our turkeys so juicy and tender? It’s our homegrown corn and good handling. We make our own feed on-site with the best ingredients available. 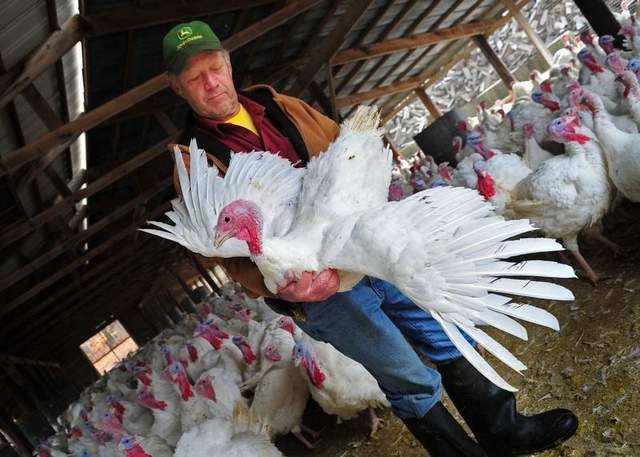 The turkeys are handled by the same few people throughout their time here at the farm, which lessens chance of disease. It also makes for calmer turkeys which means less bruising and injuries. Our turkeys have lots of room in our turkey pens, so overcrowding is never an issue. Our turkeys really are the best… we have about 5000 customers that come back every year for one! Try one today!